I mean no disrespect to the crunchy slice of pepper in your salad. But it doesn’t change my opinion: peppers are one of the few types of produce that improve with age. There are exceptions, of course. Without jalapeño slices, a fresh salsa wears no pants. In the heat-seeking nation of Bhutan, fresh hot peppers are sautéed in cheese, to great rejoicing. But most of the peppers I consume are not fresh, and this is not a problem. Late summer and early fall are when pepper plants adorn themselves with their rainbow-colored fruits, so now is a good time to think about what to do with them. Peppers can be stabilized and preserved more or less as-is, or they can be incorporated into sauces and other complex products for later use. Thin-skinned peppers are the easiest to deal with. Assuming they are completely ripe, they don’t need much. Just string them with a needle and thread and hang them in a spot with good air circulation or lay them out in ventilated racks or on screens. Under proper conditions, they can be forgotten on the windowsill and turn out fine. Once dry, they can be kept in sealed plastic bags until needed. They can be crushed and used in myriad ways or be rehydrated and made into sauce. Thick-skinned peppers, either hot or sweet, can’t be dried like the thin-skinned varieties because they’ll rot. These fleshy peppers can be either pickled or roasted and then frozen. Pickle them in a brine of half vinegar and half water, with the vinegar portion being half apple cider vinegar and half white vinegar, with sugar to taste. Each quart gets a teaspoon of salt and a tablespoon of mustard seeds. Any amount of carrots can be added to the jars. To roast hot or sweet peppers, put them under the broiler or on the grill, turning regularly until the skins blister. Cool, pack them in bags, and freeze with the skins on. They can be used down the road in sauces, on burgers or as a tasty garnish. 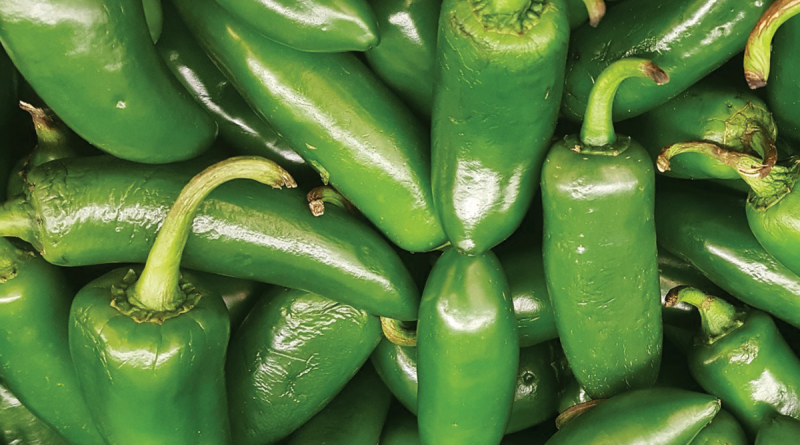 The folks at Harmons sell chiles by the bushel every Friday and Saturday at all stores starting in August and running through Labor Day. Stocked away in your freezer, those pungent, spicy pods will be available year-round when you need them. Those are the easy ways of doing it, if you are swamped with peppers and short on time. But if you have surpluses of other ingredients, and the time to deal with them, you can incorporate your peppers into something else entirely. Today I’ll discuss using chiles to help preserve tomatillos. This meaty sauce, called chile verde, can be canned or frozen. I’m giving you this recipe because, around here anyway, farmers seem to grow a lot more tomatillos than anyone knows what to do with. Any form of chile, including fresh, dried, pickled and roasted, can be used in this dish. Vegetarians and salsa-vores can skip the meat and call it salsa verde. I’ve based this recipe around one pound of tomatillos, but it makes sense to do the largest batch you can. The quantities are loose. If you don’t have a blender or food processor, you’re in for a long day. Tough cuts of meat should be braised first, or otherwise softened with heat. I recently wrapped an elk shank in foil and cooked it for a few hours at 350 until it literally fell off the bone. Later, I used that shin bone to stir the pot, which was awesome. Tender cuts of meat can be cubed and added directly to the pot. While the meat is cooking, prepare the tomatillos. If you have tons, soak them in a large bowl of water to make the peels easier to remove. Purée the tomatillos and pour into in a large kettle to slowly cook down. Emphasis on slowly. I leave the stove on the absolute lowest setting, just warm enough to allow the excess moisture to steam away. It takes hours. Scrape the sides into the brew as it retreats. How much you let it thicken is a matter of taste. The last batch I made included enough tomatillos to completely fill my 5-gallon kettle with purée, so I had to let it reduce quite a bit before I could add other ingredients. First, I added the meat, as well as the jus from the cooking pan. When there was space, I added the puréed onions. Then I added the chile, also puréed, along with garlic powder, cumin and salt, all to taste. While I love using whole cumin, it sinks to the bottom and can cause a scald spot, so powdered is advised. Finally, purée the cilantro and stir it in. I also added my last pound of puréed tomatillos, to refresh the verde color, and give a bit of that fresh tomatillo flavor. I gave a final stir and called it good. It would finish cooking in the jars. Pressure-can at 14 pounds of pressure for 40 minutes. If you don’t have the gear to do this, freeze your chile verde in bags. But don’t use a typical canning water bath; the meat, a “high risk” food, needs that pressure to make it safe to eat. By this time, your kitchen might look like a Jackson Pollock painting, and your mouth and belly might be burning from too much sampling. But the chile is secure, floating in a meaty, tangy green, sterile medium. Or perhaps it’s dried and bagged in the pantry. Either way, it will be there when we need it.